Statistically What’s The Best Time To Make Substitutions? Arsenal fans know the drill on substitutions:the first one between 67 and 70 minutes and not a minute earlier. That’s the Wenger way. Usually just one at this early stage but sometimes two, with the others following on anything up to the 90th minute. It doesn’t seem to make much difference to Arsene whether the team is winning losing or drawing at the time of the subs. He does them the same way anyway. Not for him the variation of a half time substitution when someone happens to be playing particularly badly – I’m looking at you Santos – no, let’s stick to the pattern: 67 at the earliest. Except I do recall that a match or two ago he amazed me by making a substitution on 55 minutes. Perhaps he has read this research featured in The Times on November 12, from former American professional footballer (as in soccer) and now Professor in the Department of Management and Operations in the Villanova School of Business, Pennsylvania. In summary Myers’ research indicates that if you’re losing you have the best chance of turning the game around if you make your first substitution no later than 58 minutes in, the second by 73 minutes and the third by 79 minutes. Following this pattern can double your chances of turning a game around – though it should be said that you still have a less than even chance of managing it, because if you’re losing that’s usually for a reason. Regular readers of this blog will know that I despise people trying to prove that Arteta (or whoever) is better than Rosicky (or whoever) because he makes more passes, or more successful passes, or a better percentage of successful passes, or any other damn thing to do with passes, or assists, or what his inside leg is. I was only on about it again a few days ago. But I’m okay with these substitution stats, because hundreds of games have been studied to build the picture – it is not measuring the actions of one player amongst literally millions of other essentially random actions, it’s an accumulation of a vast amount of data. 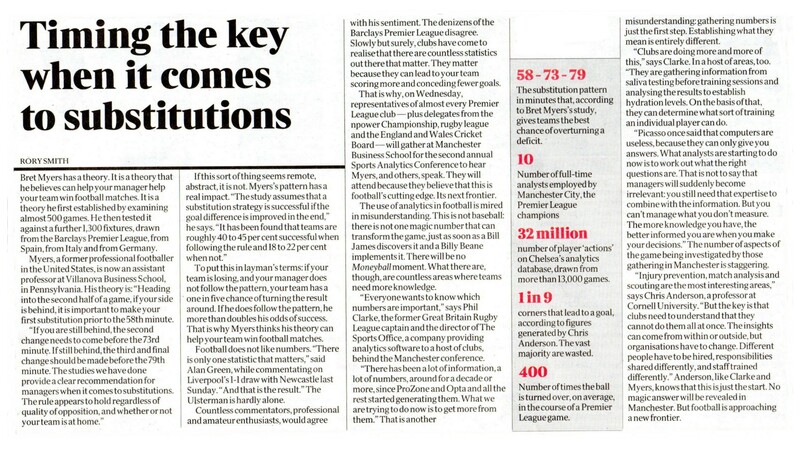 The Times piece goes on to emphasise (as I do repeatedly) that context is everything with stats, especially in football. If it wasn’t we’d all be happy to sign every 30-goal-a-season striker from a Sunday League team – cos he can score goals, right? Loads of them. In football there are now millions of pieces of statistical data collected – Chelsea’s analytics database draws on 13,000 games and has 32 million pieces of data, we are informed. What the analysts are still working on is how to make best use of all the data, given (at the risk of repeating myself once too often) the essentially random nature of football. Other interesting titbits from the sidebar: Man City have ten full time analysts now working on this stuff; one in nine corners leads to a goal – not at Arsenal it bloody doesn’t! – and in an average Premier League game the ball is turned over 400 times. I must say I’m struggling to believe that Arsenal lose possession 200 times in a match! Though perhaps with Santos in the team, they do. Great piece. Moneyball is being applied by deep pocketed clubs, making it harder for lesser frugal clubs. AW mindset stubborn, stale and unwilling to evolve for the better, as he has sadly become too predictable as a result. He looks tired and short on ideas. Um yeah…like that bricklayer sunday league fella – was awful. What was his name again. Ian Wright or something like that? Couldn’t hit the back of a barn door, in a month of sundays, could he? Wright was literally one in a million among non-league players. Like winning the lottery. You just quoted me a…statistic…to support your distrust of statistics. Thank you for underlining my point. Statistics are an important tool. Equally important is understanding the context, so that you know which statistics to look for. Most people who jump to deride statistics are too lazy to go the extra step of defiining the context. Once you do, you see how powerful it is. If a Arshavin gives away the ball more than Coquelin, its not necessarily a big deal, since Arshavin has to make more risky plays in search for a goal. However if Coquelin gives the ball away more than Arshavin you have a problem. Unless of course Arshavin is actually being too conserative. Similarly if Coquelin is giving away the ball more than Arteta, you will have to be concerned since they play similar roles. Unless for example Coquelin’s playing time is more weighted towards the end of games we are chasing, where he has to hoof the ball more. In which case we need to measure their turnovers at each state of the game. You do have to dig deeper. But you’re still going to need statistics in the end. Dont waste time with luddite arguments. You will rarely win. Tools are good – its up to use to learn how to use them properly. I’ve never said I distrust statistics. I just get fed up of people using them out of context. The problem with football is there is a hell of a lot of context, most of which is ignored by most people. I was going to say ‘ignored by 96.7% of people’ but I’m not sure you’d have taken that as a joke. And then you have Les Ferdinand who joined QPR from non-league Hayes and outscored Wright in the first 5 seasons of the Premier League. So probably more like 1800 to 1. Sir Les outscored Wrighty 5 seasons in a row?! Give me the figures Andy, or I shan’t believe it. It looks like I was misunderstood. What I meant was that in the first 5 seasons of the Premier League, Ferdinand scored more goals in total than Wright.